How much do they cost to build? This does not include the cost of groundworks and services which are different for each site. The kits can also be built on pillar foundations. This should cost no more than £2000 on a straightforward site. How much do the log home kits cost? Approximately £600 per square metre of floor space for our Finnish log houses depending on specification. At Mountain Lodge Homes we believe in the importance of integrity and honesty. We wont ‘guarantee to beat any quote’ or give you ‘45% off if you buy today’. Log thickness; our log home kits normally have logs 95mm, up to 240mm available (don’t be misled by wall thickness rather than log thickness dimensions). The inside of the external log walls are framed vertically at 600 mm centres. Kingspan or similar is then fitted between the framing. Log profile boards to cover. In a log house with 95mm logs and 100mm Kingspan insulation, this would give a total wall thickness of 213mm. Is it just the main room that has floorboards and the rest of the rooms have chipboard floors? An 8% non-refundable deposit is initially paid on placing your order, which releases drawings from our factory in Finland to enable the preparation of working drawings for submission to building control. When you are ready for the house to be manufactured the balance is paid in two further installments. Final installment 3 weeks before delivery. Previous​ customers have arranged mortgages with the Bank of Scotland, and with the Halifax. Wood is the only carbon neutral construction material. Strength for strength timber uses 5 times less energy to produce than concrete and 6 times less than steel. Every cubic metre of wood used in construction saves 0.8 tonne of CO2 from the atmosphere. Every log house built saves an average of 4 tonnes of CO2. I HAVE A BUILDING PLOT, WHAT NEXT? All our log homes require planning permission. Please contact us if you would like architectural drawings for a planning application. The cost of plans is normally around £1350 + vat. WILL WE NEED PLANNING PERMISSION FOR YOUR BUILDINGS? Normally you will require full planning permission. Please read our guide to the planning system. The Governments Standard Assessment Procedure (SAP) for assessing the energy performance of dwellings. The indicators of energy performance are energy consumption per unit floor area, an energy costing rating (the SAP Rating), and Environmental Impact rating based on CO2 emissions (The EI rating) and a Dwelling CO2 Emission rate (DER). The SAP rating is based on the energy costs associated with space heating water heating, ventilation and lighting, less costs savings from energy generating technology. It is adjusted for floor area so that it is essentially independent of dwelling size. The SAP rating is expressed on a scale of 1 to 100, the higher the number the lower the running costs, this can then be but into a band from A-G. (A being the lowest running costs, while G represents the highest costs). 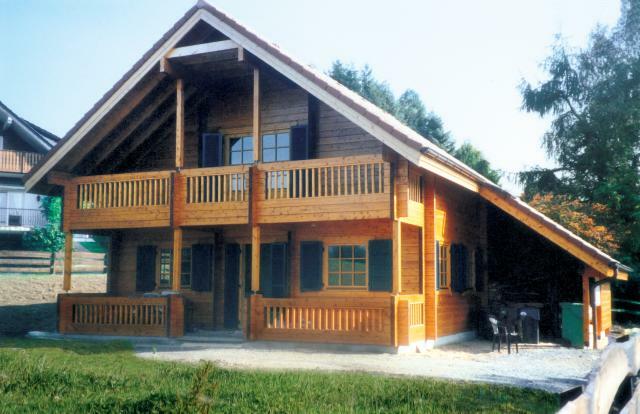 It is possible for a Mountain Lodge Home to have a SAP rating of 100. Normally eight weeks , but possibly longer at busy periods. The log houses are delivered from the factory in Finland directly to your site, as long as there is a road suitable for lorries. It’s not possible to give an accurate price without knowing the delivery address. An estimate would be £5000 for a 80 square metre house i.e. Eagle Lodge; Mountain Lodge; Mountain 110 designs, to mainland Scotland. Exchange rate and fuel price also affect the delivery cost. ARE YOUR BUILDINGS MASS PRODUCED? All our building are manufactured to order, allowing you to incorporate your own ideas. Are they expensive to heat? A well designed and well built Mountain Lodge Home is solid and tight. Industrially and precisely manufactured logs with exact joints prevent uncontrolled ventilation through the structure. The insulation and thermal mass qualities of solid wood naturally maintain the desired temperature level in all conditions, making it very energy efficient. HOW IS YOUR TIMBER DRIED? All timber is kiln dried. HOW DIFFICULT ARE THEY TO INSURE? Not difficult. Costs would appear to be the same as for a house of “standard construction”. A log home can last for generations if correctly maintained. Log homes retain their value just as well as other types of homes. What weather cover can be put on your buildings? In conjunction with your local planning officer, our buildings will support almost anything. Felt, cement tiles, slates, steel sheeting etc. Any quality wood stain will preserve the wood, and the cost will vary depending on which one you go for, and how often they require repainting, which will depend on the location. An exposed location will require more frequent treatment. The houses will last indefinitely if they are correctly maintained. CAN YOU SUPPLY A TEAM TO ERECT THE BUILDING? A local contractor will be more economical for you than sending a team from elsewhere. They will have the carpentry skills necessary to build your log home. Every log is numbered and pre-cut to simplify assembly, meaning DIY builders should also be capable of building a log cabin themselves. If you wish we can help in finding a professional crew to erect the house, or send an expert in log house supervision for advice on building the house. We are available to advise you during your construction period if you require it. The enduring qualities and craftsmanship of the log house kits is at the heart of our business! All log wall materials to be free from defects in manufacturing and workmanship, for the lifetime of the original purchaser. This warranty does not include labor, installation and shipping costs related to repair or replacement, or damages from improper handling or installation, or failure to seal­treat the log materials of the log house packages that we supply. All other materials included in our log cabin home packages such as windows, doors, etc. are warranted by their respective manufacturers. All customer requests for repair or replacement of materials covered under this warranty must be made in writing and sent directly to Mountain Lodge Homes Ltd. Double glazed, DK, TT or MSES windows. External doors pine, half glazed, and door/window furniture. All floors are 28 x 95mm pine floorboards and 48x 48mm joists for a house built on a concrete slab. (The extra materials required for a suspended floor are not included and cost approx £18 m sq extra). Please click on the following link to download a pdf of everything that is included in your log cabin kit.